Abstract: Cluster transformations are a surprisingly ubiquitous family of algebraic recurrences. They arise in diverse mathematical contexts, from representation theory and enumerative combinatorics to mathematical physics and classical geometry (Euclidean, spherical, or hyperbolic). I will present some of the most basic and concrete examples of cluster transformations, and discuss their remarkable properties such as periodicity, integrability, Laurentness, and positivity. 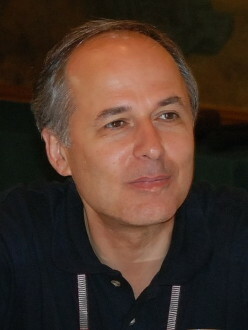 Sergey Fomin is the Robert M. Thrall Collegiate Professor at the University of Michigan. He has made fundamental contributions in combinatorics and its relations with algebra, geometry, and representation theory. His pioneering work with Andrei Zelevinsky on cluster algebras was recognized by the American Mathematical Society with the 2018 Steel Prize for Seminal Contribution to Research. He is currently an editor of the prestigious Journal of the American Mathematical Society. Among his many distinguished lectures, he gave an invited address at the 2010 International Congress of Mathematicians. Prior to joining the faculty at the University of Michigan he held positions at the Massachusetts Institute of Technology from 1992 to 2000, at the St. Petersburg Institute for Informatics and Automation of the Russian Academy of Sciences, and at the St. Petersburg Electrotechnical University. The McKnight-Zame Distinguished Lecture Series is made possible by a generous donation from Dr. Jeffry Fuqua (Ph.D., UM, 1972). These annual lectures are named in honor of Professor James McKnight, who directed Dr. Fuqua's Ph.D. thesis, and Professor Alan Zame, who was a close mentor of Dr. Fuqua. 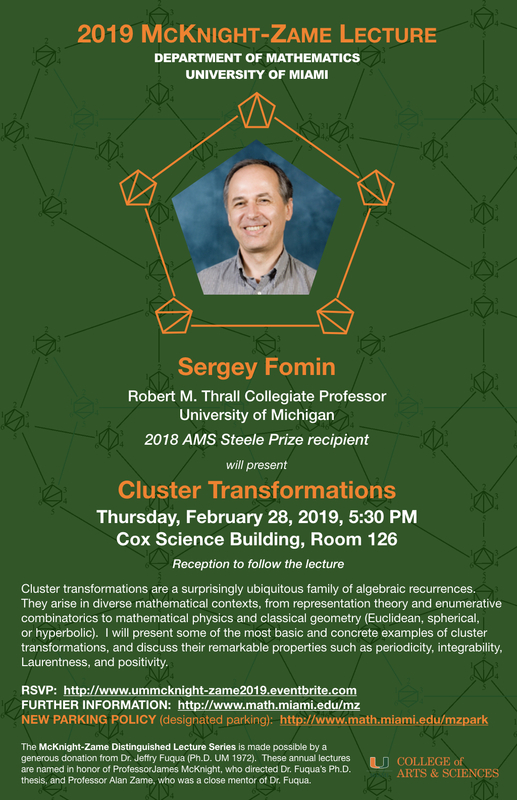 Related Event: Professor Fomin will be giving a Mathematics Colloquium on Friday, March 1 at 5:00pm in Ungar Room 402.